An NPR Books Great Read: Two never-before-published stories from the archives of one of science fiction's all-time masters. The novella "A Necessary Being" showcases Octavia E. Butler's ability to create alien yet fully believable "others." Tahneh's father was a Hao, one of a dwindling race whose leadership abilities render them so valuable that their members are captured and forced to govern. When her father dies, Tahneh steps into his place, both chief and prisoner, and for twenty years has ruled without ever meeting another of her kind. She bears her loneliness privately until the day that a Hao youth is spotted wandering into her territory. As her warriors sharpen their weapons, Tahneh must choose between imprisoning the newcomer -- and living the rest of her life alone. The second story in this volume, "Childfinder," was commissioned by Harlan Ellison for his legendary (and never-published) anthology The Last Dangerous Visions?. A disaffected telepath connects with a young girl in a desperate attempt to help her harness her growing powers. But in the richly evocative fiction of Octavia E. Butler, mentorship is a rocky path, and every lesson comes at a price. The award-winning author of science fiction classics Parable of the Sower and Kindred bestows these compelling, long lost gems "like the miraculous discovery that the beloved book you've read a dozen times has an extra chapter" (Los Angeles Review of Books). Harlan Ellison and Dangerous Visions are registered trademarks of the Kilimanjaro Corporation. All rights reserved. Log In to track Octavia E. Butler on eReaderIQ. 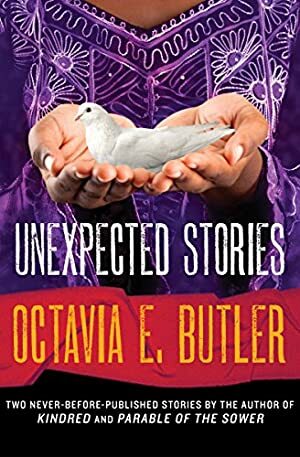 to be notified each time the price drops on any book by Octavia E. Butler. to stop tracking Octavia E. Butler. Log In to track Walter Mosley on eReaderIQ. to be notified each time the price drops on any book by Walter Mosley. to stop tracking Walter Mosley. We started tracking this book on April 29, 2014. This book was $3.19 when we started tracking it. The price of this book has changed 105 times in the past 1,822 days. The current price of this book is $7.99 last checked 7 hours ago. This lowest price this book has been offered at in the past 90 days is $1.13. The lowest price to date was $0.99 last reached on November 23, 2018. The highest price to date was $7.99 last reached on April 16, 2019. This book has been $7.99 one time since we started tracking it. We last verified the price of this book about 7 hours ago. At that time, the price was $7.99. This price is subject to change. The price displayed on the Amazon.com website at the time of purchase is the price you will pay for this book. Please confirm the price before making any purchases.